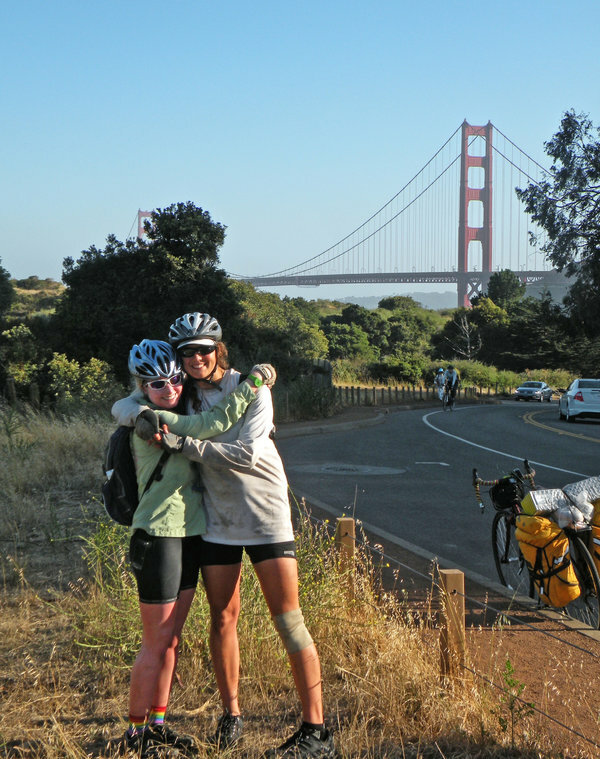 Katie Kramon, left, and Elise Guinee-Cooper, near the Golden Gate Bridge. Oregon had never seemed so nasty. For two long days in 2013, I had bicycled south with two intrepid college friends along its coast, into a relentless gale, the rainy headwinds leaving us exhausted, our flat tires as frequent as East Coast potholes. Now we sat soaked on the side of a piney road, in the middle of nowhere, with no place to stay. One companion, ever the optimist, excitedly told us she had found an online organization with the fuzzy name of Warm Showers: “It’s like Couchsurfing for bike tourers,” she said, referring to the free-stay site for travelers. Warm Showers pairs itinerant bicyclists with hosts, who offer their homes at no charge. The hope is that the cyclists will themselves play host in turn. I was skeptical. I had cycled across the United States twice and never heard of it. How did we know this wasn’t a trap, set by predatory homebodies to lure naifs like us? But we were desperate, so we agreed to call Brian Heron, a nearby Warm Showers host. He showed up within 20 minutes, asking whether we needed a ride up the hill to his place and whether we liked pizza. (No, and yes.) We arrived at his house covered in mud and smelling like wet dogs. Mr. Heron, an ordained Presbyterian pastor who had first experienced Warm Showers as a guest on a 2011 bicycle trip across the West, told us to leave our gritty bikes in the front hallway (you wouldn’t want them to rust in the rain, he said) and to put our wet clothes in the dryer. Then he served us mountains of Hawaiian pizza, ice cream and brownies. Chris Lang, Ms. Kramon, Ms. Guinee-Cooper, Dave and Linda Allen in Santa Rosa, Calif.
Was this too good to be true? Warm Showers started small in 1993, but its website now lists 39,000 hosts and 89,000 bicycle tourers — people who hit the road for extended long-distance trips — in 175 countries. It is built, the website says, “on 100 percent reciprocal hospitality.” Hosts offer what they can: a couch, a room, or a place outside to pitch a tent, and sometimes meals, too. They receive no benefit other than the chance to make new friends and hear stories of the road. And unlike the for-profit Airbnb, Warm Showers is run by volunteers. How Warm Showers has succeeded in the face of everyday human frailty is something of a mystery, even to its founders. Only one significant theft has been reported, according to Louis Melini, a former board member, and only a handful of hosts have made guests uncomfortable enough for them to complain. (Both hosts and guests can post reviews online.) The offenders were promptly removed from the site. Of course, there have been cases in which guests have overstayed their welcome, hanging around for more than a night or two, monopolizing the host’s living room, and kitchen. Some guests have more colorful backgrounds than others. My mother, a Warm Showers host who joined the site in 2014 to repay the hospitality bestowed upon her daughter, learned by going online that a guest, staying downstairs on the living room sofa, had been accused of abusing his ex-wife. She was relieved when he pedaled off the next day. Another time, she returned home to find her guests of five days cooking up a meal and making a royal mess of the kitchen. But most of her memories of guests are fond ones, including the time one fell in love with her usually moody dog. Another sent her postcards for weeks after leaving. Happy matches are common. 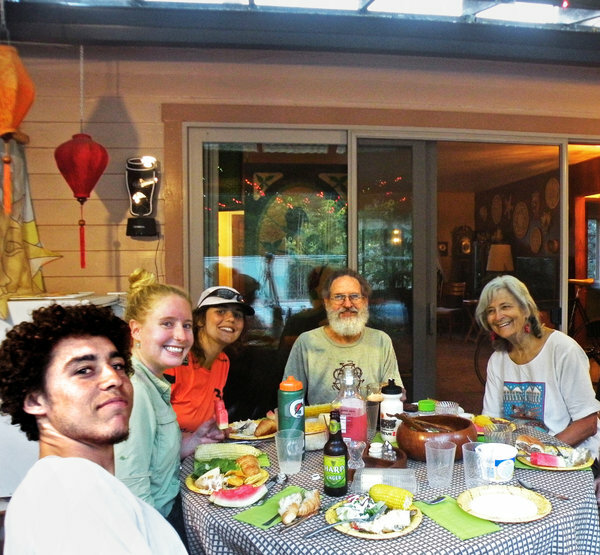 Some cyclists return year after year to hosts with whom they feel a special bond, and those riders may in turn open their own homes. Warm Showers expects cyclists treated with kindness to pass it forward, as Mr. Heron has. Due in part to that vibe, the organization has grown fast, attracting 20,000 new members in 2014 and 25,000 in 2015. Hosts can be found in countries including Kazakhstan, Vietnam, Zimbabwe and Ecuador. Stories are a bike tourer’s greatest currency, especially with hosts who have desk jobs and dream of returning to the road. Ethel MacDonald of Missoula, Mont., has stayed with 140 Warm Showers hosts all over the world, and recently celebrated her 77th birthday with a tour through Spain. One host has invited her to his daughter’s wedding in June. In turn, she has welcomed 150 cyclists into her home, she said. Louis Melini, Julie Melini and Álvaro Neil. Mr. Melini, 65, a physician assistant, was a Warm Showers board member from its founding through last summer. 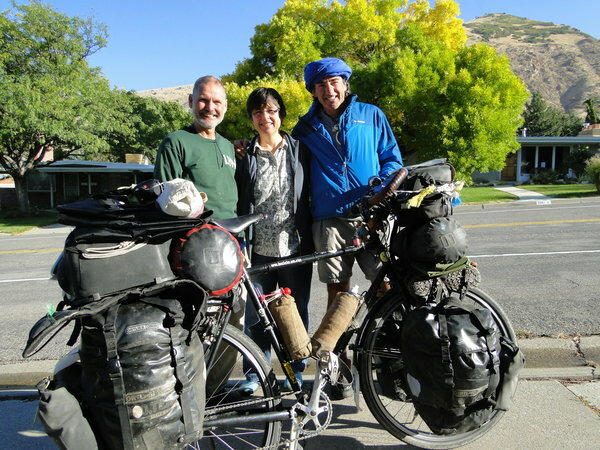 He and his wife, Julie, have a combined 25,000 bicycle touring miles and just finished hiking the Appalachian Trail, returning the hospitality they have received on the road when they are back home in Salt Lake City. One of the couple’s Warm Showers guests was Pablo Garcia, an Argentine who has cycled thousands of miles, on every continent. Another was Álvaro Neil, 50, of Spain, a lawyer who is also known as Biciclown, and who hopes to make it all the way around the world. The organization is trying to make it more difficult to sign up as a guest without also becoming a host, encouraging new users to list themselves as both. It’s a tough ask, as many bike travelers don’t spend much time in one place. Ken Francis of Long Beach, Calif., who has cycled across the country three times, finally bought a house with a yard that he deemed adequate to host cyclists with tents. He has since responded to each of the more than 75 people who have contacted him through the website. My friends and I stayed with several Warm Showers hosts during our ride from Seattle to San Francisco, including Phillip Michael Long of Kelso, Ore. We never had a chance to thank him; he was off to work before we hit the road the next morning. Our final hosts were Linda and Dave Allen of Santa Rosa, Calif., who put us up the night before we rolled into San Francisco, on the Fourth of July. They told us about Dave’s cross-country trip on a bicycle with a giant front wheel, requiring him to use a footstool to reach the seat. And of their 16 years sailing the world. And how they had ridden an antique tandem across Europe. Empty nesters, they took us in as if we were their children’s childhood friends. We churned ice cream on the back porch, adding blackberries the couple had just picked. They found some old sparklers in their basement, and we all ran around barefoot on their back lawn, watching them glow.